Copyright © 1990-2017 by DisplayMate Technologies Corporation. All Rights Reserved. Large screen TVs are often watched by multiple viewers from a wide range of viewing positions and viewing angles. A single viewer may also watch TV from several different viewing positions. As a result, it is very important that every viewer watching the TV should see the same high picture quality regardless of their viewing position and angle – with everyone enjoying accurate and consistent colors and contrast from wherever they are watching. The range of viewing positions and angles varies from home to home, and also worldwide. Studies in several countries have found that 80% of the TV viewers are generally within ±30° of the center of the screen, with most of the remaining 20% within ±45°, and a small number extending all the way out to ±60°. In my own home theater a favorite sofa results in a 45° viewing angle. However, most TV viewers may not be aware of the changes in picture quality when they move to a different viewing position because almost all TV content is constantly changing. As a result, it can be hard to identify and track the differences from each viewing position and angle. One good way to visually evaluate the changes with viewing position is by putting up a still photograph that has a wide range of color content and a wide range of picture brightness and contrast, and then walk by the TV at a steady pace from the far left to far right sides, noting the picture variations and changes that you see. We will also discuss some ways to evaluate the viewing angle picture variations when shopping for a TV at a store. Below we’ll start off with some screen shots to demonstrate the visual differences with viewing angle, but in this article we will rely primarily on extensive Lab tests and measurements to quantitatively compare the picture differences and changes with viewing angle. · The Picture Brightness in almost all cases decreases as the viewing angle increases for all TV display technologies. · The Picture Contrast can either increase or decrease with viewing angle depending on the TV’s display technology. · The Picture Color Gamut can either slightly increase or significantly decrease with viewing angle depending on the TV’s display technology. · The Picture Color Shifts are the most visually noticeable variations and changes with viewing angle, which depend on the particular TV display technology. Both the Hue and Saturation for each of the millions of colors contained within the entire TV Color Gamut can shift by differing amounts when the viewing angle changes. We will map them in detail below. · TN Twisted Nematic is the earliest and most basic LCD technology where the Liquid Crystal is twisted by the electric field produced for each sub-pixel. It is still being used in low cost displays, including many laptops, but is no longer used in TVs because it has extremely large brightness, contrast, and color shifts with viewing angle. · VA Vertical Alignment is a widely used LCD technology where the Liquid Crystal is vertically aligned perpendicular to the glass substrate with an orientation that changes with the electric field produced for each sub-pixel. VA LCDs are widely used in TVs and monitors. Its major advantage is a high Contrast Ratio, but as we’ll see below it has significant Color Shifts and Contrast Shifts with viewing angle. · IPS In-Plane Switching is a widely used LCD technology where the Liquid Crystal is horizontally aligned to the glass substrate with an orientation that changes with the electric field produced for each sub-pixel. IPS LCDs are widely used in TVs, monitors, laptops, tablets, and smartphones, including all LCD iPhones. As we’ll see below, the major advantages of IPS LCDs are very small Color Shifts and Contrast Shifts with viewing angle. Both TVs use Nano-technology to enhance their Color Gamut and Color Saturation. The LG TV has Nano Cells in front of the LCD panel, and the Samsung TV has Quantum Dots in the Backlight behind the LCD panel. To evaluate the Picture Changes with viewing angle for each TV we will compare their picture and performance seen from a 45° viewing angle position to their picture and performance seen from the ideal 0° Sweet Spot. For all the tests we used the most color accurate Picture Mode for each TV: the Cinema mode for the LG TV and the Movie mode for the Samsung TV. We’ll start with Screen Shots of the two TVs to visually demonstrate the changes and differences with viewing angle. Then we’ll provide the results of our series of in-depth Lab tests and measurements with a Spectroradiometer to quantitatively analyze the changes and differences in both color and contrast with viewing angle. The photos below are screen shots of both TVs taken at 0° and 45° for visually comparing the picture changes with viewing angle. For the 45° side viewing angle, the keystone geometric distortion that is normally seen from that position has been removed to make the comparison with 0° more straight forward. The photos below are from the DisplayMate Multimedia with Test Photos Edition. · The LG IPS LCD TV shows only small and barely noticeable Color Shifts and changes between the 0° and 45° viewing angle positions. · The Samsung VA LCD TV shows relatively large changes in hue, saturation, and image contrast between the 0° and 45° viewing angle positions. The colors and contrast are noticeably weaker and washed out from the 45° viewing position. Below we provide the results of our extensive in-depth Lab tests and measurements with a Spectroradiometer together with the proprietary DisplayMate Test Patterns to quantitatively analyze the changes and differences in both picture color and contrast with viewing angle. We first measure the Color Gamuts and the Intensity Scales for the TVs, and then measure both the 2K Full HD picture content and the 4K Ultra HD picture content, first at 0° and then again at 45° using 41 Reference Colors that completely cover each Color Gamut uniformly, and accurately map out the Color Shifts with viewing angle. Before we map all of the Color Shifts within each Color Gamut we first measure just the Color Gamuts themselves, which are defined by the Red, Green, and Blue Primary Colors for each Color Gamut. · The traditional smaller sRGB / Rec.709 Color Gamut for 2K Full HD that is used for most existing consumer content for TVs, including broadcast, cable, satellite, DVD movies, Blue-ray movies, plus the internet, computers, and most consumer cameras, photos, and videos. · The new Wide DCI-P3 Color Gamut for 4K Ultra HD and High Dynamic Range HDR TV content plus Digital Cinema. The amount of 4K Ultra HD TV content is increasing rapidly, and is now primarily available through internet streaming and Ultra HD Blue-ray movies. To evaluate the Color Changes with Viewing Angle we measured the Primary Colors for each Color Gamut. Figure 2 below shows the variation in both the 2K Full HD Gamut and 4K Ultra HD Wide Gamut, and Table 1 lists the Shift in the size of each Color Gamut from 0° to 45° viewing angles. For the 4K Ultra HD Color Gamut, there is almost no change with viewing angle because it is the Native Color Gamut for each TV, so the pure Red, Green, and Blue Primary Colors that define the Native Gamut barely change at all with viewing angle, as expected. However, all of the Native Gamut’s interior colors that are used to make all of the picture content for the TV can change significantly with viewing angle because they are produced by intensity mixtures of the Native Primaries, which can vary significantly with viewing angle. We will analyze these interior colors in the sections below. One very important case is the smaller widely viewed 2K Full HD Color Gamut, which is produced by intensity mixtures of the Native Color Gamut Primaries. 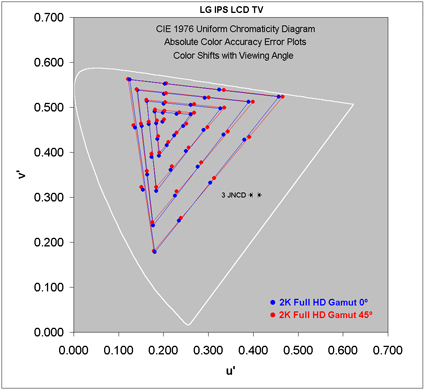 · The LG IPS LCD TV Full HD Color Gamut changes only slightly, increasing by just 3% at 45°. The yellow marked 45° Gamut is barely noticeable in the figure due to the close overlap with the 0° Gamut. · The Samsung VA LCD TV Full HD Color Gamut changes drastically, decreasing to 55% at 45°, producing a major loss of Color Saturation with viewing angle. The yellow marked 45° Gamut is only about half the size of the 0° Gamut, which is a very large, visually significant, and noticeable decrease. 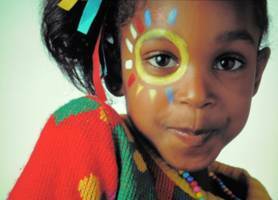 Next we examine the Intensity Scales, which control the color mixtures that produce all of the Picture Colors. The Intensity Scale (sometimes called the Gray Scale) not only controls the Picture Contrast within all displayed images but it also controls how the Red, Green, and Blue Primary Colors mix to produce all of the on-screen picture colors. So, the variation in the Intensity Scale with viewing angle is the key not only to the Shift in Picture Contrast but also to the Color Shifts with viewing angle, which we will cover in later sections. The Picture Brightness also changes with viewing angle, which we need to examine before the Intensity Scale. 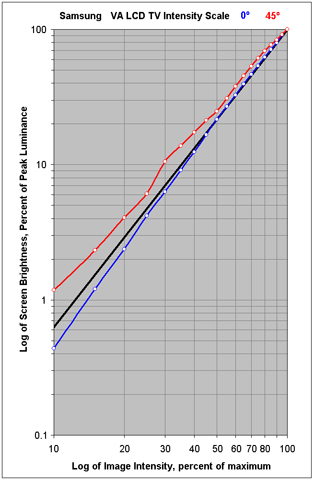 Table 2 below lists the decrease in Brightness (technically the Luminance) from 0° to 45° viewing angles. All display technologies show a decrease – both TVs show a large decrease in Brightness, which is typical for all LCDs. The eye automatically adjusts to any changes in Picture Brightness, so the decrease is not a problem unless the ambient light level falling on the TV screen noticeably reduces the Picture Contrast. The Intensity Scale shows how the Picture Brightness varies with the digital signal levels in the Picture Content. The Industry Standard Intensity Scale is based on a logarithmic (power-law) relation that appears as a straight line on a log-log graph with a slope called Gamma, which is plotted in Figure 3 below for both TVs. The Industry Standard is the Black Line with a Standard Gamma of 2.2. In order to produce accurate Colors and Contrast for all picture content the measured Intensity Scale for a TV must closely match the Gamma 2.2 Standard. As shown in Figure 3 and Table 3 below, at 0° the LG TV is close to the Standard with a Gamma of 2.26, while the Samsung TV is somewhat less accurate with a Gamma of 2.36. This affects the Absolute Accuracy of the Picture Content, however, here we are just examining the Changes and Shifts with viewing position and angle. If there is any Shift in the Intensity Scale between 0° and 45° then it will cause Color Shifts and Picture Contrast Shifts with viewing angle. · The LG IPS LCD TV has almost no change in the Intensity Scale between 0° and 45°. This indicates that the Colors Shifts with viewing angle will also be small. Table 3 shows that the Picture Contrast decreases by just 5% between 0° and 45°, which is barely noticeable. · The Samsung VA LCD TV has a large change in the Intensity Scale between 0° and 45°. This indicates that the Colors Shifts with viewing angle will also be large. The Intensity Scale is much less steep at 45°, which reduces the Picture Contrast. Table 3 shows that the Picture Contrast decreases by 63% between 0° and 45°, which is a very large, visually significant, and noticeable decrease. 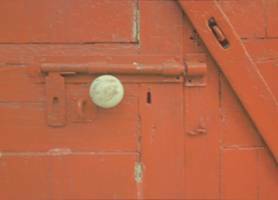 Next we examine the Color Shifts with viewing angle. We are now ready to determine the Color Shifts for all of the colors within each Color Gamut. We begin with the 2K Full HD Gamut that is used for most existing consumer content for TVs, including broadcast, cable, satellite, DVD movies, Blue-ray movies, plus the internet, computers, and most consumer cameras, photos, and videos. All of the color measurements and analysis in this article uses the CIE 1976 Uniform Chromaticity (Color) Diagram, which quantitatively evaluates human Color Vision in a perceptually uniform manner. 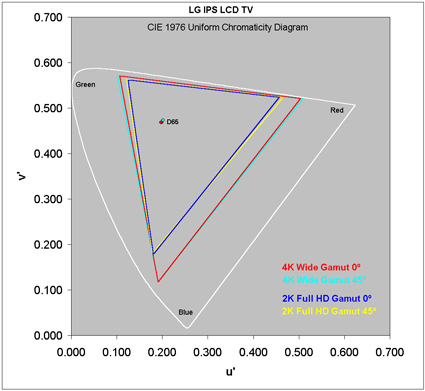 For an in-depth discussion of Color Gamuts, Color Vision, and the CIE Diagram see this article. Figure 4a shows an Accurately Colorized CIE Color Diagram for the 2K Full HD Gamut with the 41 Reference Colors that are used to evaluate the color distribution within the 2K Full HD Gamut. Using a Laboratory Spectroradiometer we measure each of the 41 Reference Colors on each TV, first at the 0° viewing angle and then at the 45° viewing angle. The results are compared below. 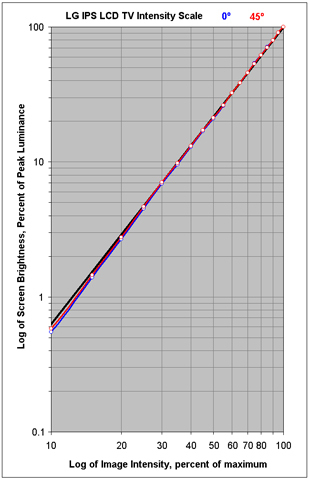 Figure 4b below shows the measured 41 Reference Colors for each TV, with the 0° viewing angle marked with blue data points, and the 45° viewing angle marked with red data points. The smaller the difference between the blue and red data points the smaller the Color Shifts with viewing angle. We analyze Color Accuracy and Color Shifts here in terms of MPCD Minimum Perceptible Color Difference or JNCD Just Noticeable Color Difference, where 1 MPCD = 1 JNCD = Δ(u'v') = 0.0040 on the CIE 1976 Uniform Chromaticity Scale in Figures 4-6. Color differences less than 1 JNCD are visually indistinguishable, while values greater than 1 JNCD are visually noticeable when the two colors are touching on-screen. When the colors are not touching and are further apart, the visual threshold for Just Noticing a Color Difference is higher. Here we will use 3.5 JNCD for the threshold of a visually noticeable display color difference for different viewing positions. The 3 JNCD color difference is shown in the Figures 4-6. · The LG IPS LCD TV shows only small Color Shifts within the entire 2K Full HD Color Gamut. The Average Color Shift is 1.9 JNCD and the Maximum Color Shift is 3.5 JNCD, which are barely noticeable visually. So every viewer watching the LG IPS LCD TV should see the same high picture quality regardless of their viewing position and angle, up through at least 45°. · The Samsung VA LCD TV shows very large Color Shifts throughout the entire 2K Full HD Color Gamut. We have included connecting vectors to help identify the biggest Color Shifts, which are so large that they are hard to follow. The Average Color Shift is 8.6 JNCD and the Maximum Color Shift is 21.0 JNCD, which is very large and visually apparent. Out of the 41 Reference Colors, there are 27 Reference Colors with more than 5 JNCD Color Shifts and 16 Reference Colors with more than 10 JNCD. Note that there are major decreases in Color Saturation and also large Hue Shifts as well. So viewers watching the Samsung VA LCD TV who are not relatively close to the 0° viewing angle Sweet Spot will see large Color Shifts with significantly reduced Color Saturation and Picture Contrast. Next we examine the Color Shifts for the larger Wide DCI-P3 Color Gamut that is used in 4K Ultra HD and HDR TV content and in Digital Cinema. 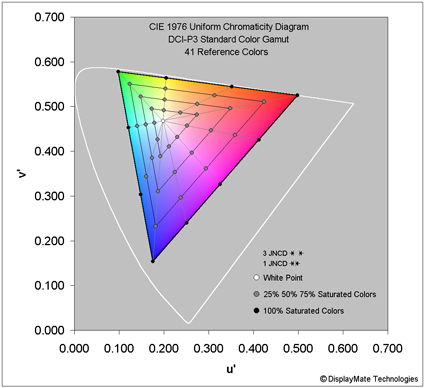 Figure 5a shows an Accurately Colorized CIE Color Diagram for the 4K Ultra Wide DCI-P3 Gamut with the 41 Reference Colors that are used to evaluate the color distribution within the 4K Wide DCI-P3 Gamut. Using a Laboratory Spectroradiometer we measure each of the 41 Reference Colors on each TV, first at the 0° viewing angle and then at the 45° viewing angle. The results are compared below. Figure 5b below shows the measured 41 Reference Colors for each TV, with the 0° viewing angle marked with blue data points, and the 45° viewing angle marked with red data points. The smaller the difference between the blue and red data points the smaller the Color Shifts with viewing angle. · The LG IPS LCD TV shows only small Color Shifts within the entire 4K Wide DCI-P3 Color Gamut. The Average Color Shift is 2.1 JNCD and the Maximum Color Shift is 4.8 JNCD, which are barely noticeable visually. So every viewer watching the LG IPS LCD TV should see the same high picture quality regardless of their viewing position and angle, up through at least 45°. · The Samsung VA LCD TV shows very large Color Shifts throughout the entire 4K Wide DCI-P3 Color Gamut. We have included connecting vectors to help identify the biggest Color Shifts, which are so large that they are hard to follow. The Average Color Shift is 8.1 JNCD and the Maximum Color Shift is 20.5 JNCD, which is very large and visually apparent. Out of the 41 Reference Colors, there are 24 Reference Colors with more than 5 JNCD Color Shifts and 16 Reference Colors with more than 10 JNCD. Note that there are major decreases in Color Saturation and also large Hue Shifts as well. So viewers watching the Samsung VA LCD TV who are not relatively close to the 0° viewing angle Sweet Spot will see large Color Shifts with significantly reduced Color Saturation and Picture Contrast. The above viewing angle measurements and results are for the brightest picture content. But most TV picture content is generally below the brightest 100% Intensity levels, and even brightly lit scenes almost always have dimmer and often much darker areas. As a result, most TV picture content contains lots of image brightness detail that falls in the dimmer 75% to 25% Intensity levels shown in Figure 3. Variations anywhere in the Intensity Scale will produce additional picture variations and Color Shifts with viewing angle for all of the dimmer content, which we cover next. For Figure 6 we also measured the 0° to 45° viewing angle Color Shifts for the dimmer 75%, 50%, and 25% picture content brightness levels in addition to the 100% levels shown in Figure 5. The 25% Intensity levels have just 5% of the Brightness (Luminance) of the 100% Intensity levels, so we are covering most of the picture content brightness range that you see on TV. The measured 41 Reference Colors at 45° for the 100% Intensity levels are marked with green data points, the 75% Intensity levels with cyan data points, the 50% Intensity levels with magenta data points, and the 25 Intensity levels with yellow data points. They are all being compared to the 0° measured Reference Colors with 100% Intensity levels, which are marked with black data points. Again, the smaller the differences between the data points the smaller the Color Shifts with viewing angle for all TV picture content. 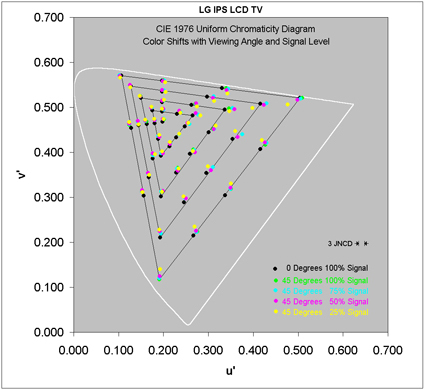 · The LG IPS LCD TV again shows only small Color Shifts within the entire 4K DCI-P3 Color Gamut for all the Intensity levels. So every viewer watching the LG IPS LCD TV should see the same high picture quality regardless of their viewing position and angle, for all picture brightness levels and viewing angles up through at least 45°. 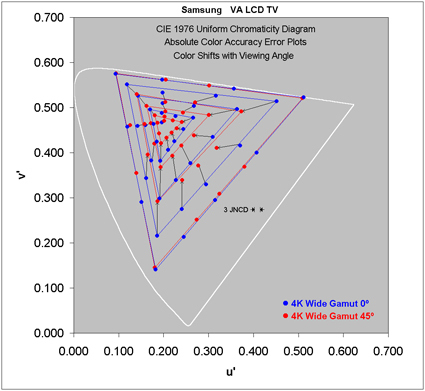 · The Samsung VA LCD TV again shows very large Color Shifts throughout the entire 4K Wide DCI-P3 Color Gamut for all the Intensity levels and viewing angles between 0° and 45°. We have included connecting vectors to help identify the biggest Color Shifts, which are so large that they are hard to follow. The Color Shifts are again very large and visually apparent. So viewers watching the Samsung VA LCD TV who are not relatively close to the 0° viewing angle Sweet Spot will see large Color Shifts with significantly reduced Color Saturation and Picture Contrast, for all Picture Brightness levels. In this article we have examined in detail the changes in TV Picture Quality with viewing position and angle. Large screen TVs are often watched by multiple viewers from a wide range of viewing positions and viewing angles, and a single viewer may also watch TV from several different viewing positions. As a result, it is very important that every viewer watching the TV should see the same high picture quality regardless of their viewing position and angle – with everyone enjoying accurate and consistent colors and contrast from wherever they are watching. · The LG IPS LCD TV has relatively small changes with viewing angle for the Color Gamut and Intensity Scale, small Color Shifts for 2K Full HD picture content, and small Color Shifts for 4K Wide Gamut picture content for all picture brightness levels. So every viewer watching the LG IPS LCD TV should see the same high picture quality regardless of their viewing position and angle, for all picture brightness levels and viewing angles up through at least 45°. Note that IPS LCD technology is also widely used in monitors, laptops, tablets, and smartphones, including all LCD iPhones, so similar results also apply to them as well. · The Samsung VA LCD TV has large changes with viewing angle for the Color Gamut and the Intensity Scale, large Color Shifts for 2K Full HD picture content, and large Color Shifts for 4K Wide Gamut picture content for all picture brightness levels. So viewers watching the Samsung VA LCD TV who are not relatively close to the 0° viewing angle Sweet Spot will see large Color Shifts with significantly reduced Color Saturation and Picture Contrast, for all Picture Brightness levels. Note that VA LCD technology is also widely used in monitors, so similar results also apply to them as well. Very few TV reviews examine the changes in TV Picture Quality with Viewing Angle. So if you want to evaluate this yourself when shopping for TVs in a store, it can be challenging because the running demo videos generally have rapidly changing picture content. But in most cases the demos periodically repeat after a while, so first identify the best picture content segment, then watch it first at 0°, reposition yourself to 45° and wait for the same segment to reappear. If you have trouble recalling both from memory alone, then use your smartphone to take screen shots at both positions and toggle between them to compare the changes in color and contrast. Repeat for each TV you are considering. DisplayMate Technologies specializes in proprietary advanced scientific display calibration and mathematical display optimization to deliver unsurpassed objective performance, picture quality and accuracy for all types of displays including video and computer monitors, projectors, TVs, mobile displays such as Smartphones and Tablets, and all display technologies including LCD, OLED, 3D, LED, LCoS, Plasma, DLP and CRT. This article is a lite version of our intensive scientific analysis of TV and Smartphone displays – before the benefits of our advanced mathematical DisplayMate Display Optimization Technology, which can correct or improve many of the display deficiencies. We offer DisplayMate display calibration software for consumers and advanced DisplayMate display diagnostic and calibration software for technicians and test labs.